4896. Clair H RUPERT (Arthur Lester RUPERT , Hannah Elizabeth DODSON , Caroline BITLER , Mark , John , Johannes ). 9496 M i Steven D RUPERT. 4897. Lavona M SWEENEY [scrapbook] (Wesley Joseph SWEENEY , Sarah Jane BANKES , Caroline BITLER , Mark , John , Johannes ) was born in 1900 in Iola Columbia Co, PA. She died on 14 May 1967. She was buried in Waller Cemetery, Waller, Jackson Twp, Columbia Co, PA.
Lavona married Clarence Atlee FRITZ [scrapbook] 1, son of Jefferson FRITZ and Martha SAVAGE, in Jan 1923. Clarence was born in 1878 in Jackson Twp, Columbia Co, PA. He died on 4 Oct 1968 in Ideal Hospital, Endicott, Broome Co, NY. He was buried on 7 Oct 1968 in Waller Cemetery, Waller, Jackson Twp, Columbia Co, PA.
+ 9497 M i Robert L FRITZ. 4904. 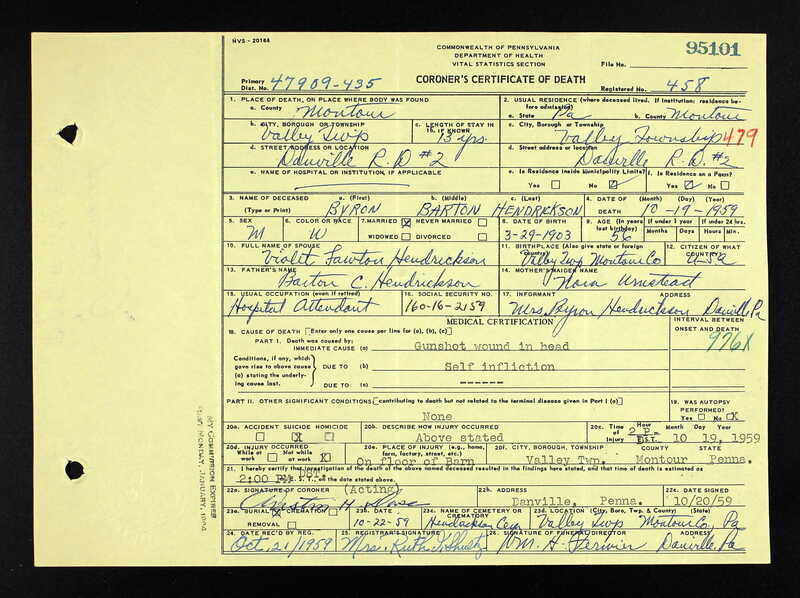 Violet Mae LAWTON [scrapbook] 1 (Ida Caroline SWEENEY , Sarah Jane BANKES , Caroline BITLER , Mark , John , Johannes ) was born on 6 Dec 1911 in Millville, Columbia Co, PA. She died in Sep 1981. 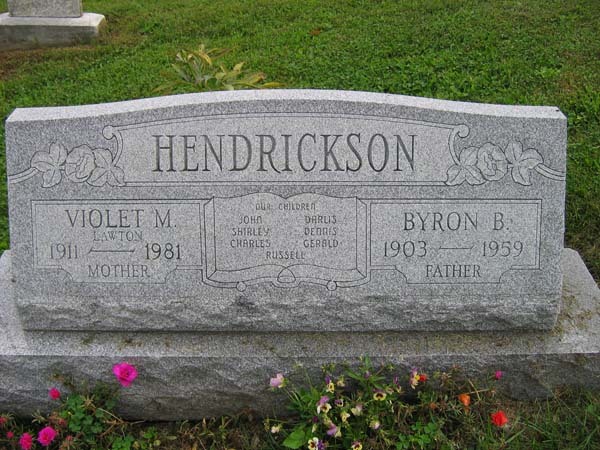 She was buried in Hendrickson Cemetery, Valley Twp, Montour Co, PA.
Violet resided in 1920 in Madison Twp, Columbia Co, PA. She resided in 1930 in White Hall, Anthony Twp, Montour Co, PA. She resided in 1940 in Derry Twp, Montour Co, PA. She was issued a social security number in 1957/1959 in PA.
Violet married Byron Barton HENDRICKSON [scrapbook] 1, son of Barton Clyde HENDRICKSON and Nora E UMSTEAD. Byron was born on 29 Mar 1903 in Valley Twp, Montour Co, PA. He died on 19 Oct 1959 in Valley Twp, Montour Co, PA. He was buried on 22 Oct 1959 in Hendrickson Cemetery, Valley Twp, Montour Co, PA.
Byron resided in 1930 in Valley Twp, Montour Co, PA. He resided in 1940 in Derry Twp, Montour Co, PA. He worked as laborer - stone quarry in 1940. John S HENDRICKSON was born about 1932 in PA. He died before 2015. John resided in 1940 in Derry Twp, Montour Co, PA.
Shirley A HENDRICKSON 1 was born on 14 Jul 1933 in Danville, Montour Co, PA. She died on 26 Feb 2015 in Geisinger Medical Center, Danville Montour Co, PA. She was buried on 4 Mar 2015 in Hendrickson Cemetery, Valley Twp, Montour Co, PA.
Shirley resided in 1940 in Derry Twp, Montour Co, PA. She was a member of Salvation Army in Danville, Montour Co, PA. She resided in Feb 2015 in Mahoning St, Danville, Montour Co, PA.
Charles B HENDRICKSON was born about 1935 in PA. He died before 2015. Charles resided in 1940 in Derry Twp, Montour Co, PA.
9501 M iv Russell L HENDRICKSON. 9502 F v Darlis E HENDRICKSON. 9503 M vi Dennis HENDRICKSON. 9504 M vii Gerald HENDRICKSON. 4906. Edna Arthena LAWTON 1, 2, 3 (Ida Caroline SWEENEY , Sarah Jane BANKES , Caroline BITLER , Mark , John , Johannes ) was born on 24 Sep 1916 in Jerseytown, Columbia Co, PA. She died in Aug 1976. She was buried in Columbia Hill Cemetery, Columbia Hill, Montour Co, PA.
Edna resided in 1920 in Madison Twp, Columbia Co, PA. She resided in 1930 in White Hall, Anthony Twp, Montour Co, PA. She was issued a social security number in 1953/1955 in PA.
Edna married William Melvin DAVIS 1, 2, 3. William was born in 1913. He died in 1960. He was buried in Columbia Hill Cemetery, Columbia Hill, Montour Co, PA.
William M DAVIS 1, 2, 3 was born in 1937. He died in 1963. He was buried in Columbia Hill Cemetery, Columbia Hill, Montour Co, PA.
William married Patricia. Patricia was born in 1939. She died in 1979. She was buried in Columbia Hill Cemetery, Columbia Hill, Montour Co, PA.
Norma L DAVIS 1, 2 died before Nov 2006. Norma resided in 1995 in RR 1 Muncy, Lycoming Co, PA.
+ 9507 M iii Joseph M DAVIS was born on 29 Apr 1940. He died on 23 Feb 1995. + 9508 F iv Josephine Jean DAVIS was born on 29 Apr 1940. She died on 17 Jan 2006. Sara E DAVIS 1, 2 died before 1995. Nancy L DAVIS 1, 2 was born in 1942. She died in 1969. She was buried in Columbia Hill Cemetery, Columbia Hill, Montour Co, PA.
+ 9511 M vii Robert L DAVIS was born on 19 Sep 1943. He died on 6 May 2003. + 9512 F viii Martha A DAVIS was born on 12 Mar 1945. She died on 28 Nov 2006. 9513 F ix Linda K DAVIS. 9514 F x Shirley M DAVIS. 9515 M xi Harvey L DAVIS. 9516 F xii Evelyn M DAVIS. 9517 F xiii Donna J DAVIS. Connie Rose DAVIS 1, 2 died before 1995. 4908. Betty Z LAWTON 1 (Ida Caroline SWEENEY , Sarah Jane BANKES , Caroline BITLER , Mark , John , Johannes ) was born on 16 Jun 1921 in Montour Co, PA. She died on 8 Nov 1993 in Muncy, Lycoming Co, PA. She was buried in Plot C 82, Muncy Cemetery, Muncy, Lycoming Co, PA.
Betty resided in 1930 in White Hall, Anthony Twp, Montour Co, PA.
Betty married Sylvan E REESE 1, son of Brady REESE and Julia BALL, on 24 Dec 1941. Sylvan was born on 1 Oct 1917 in Madison Twp, Columbia Co, PA. He died on 25 Dec 1991 in Divine Providence Hospital, Williamsport, Lycoming Co, PA. He was buried on 28 Dec 1991 in Plot C 82, Muncy Cemetery, Muncy, Lycoming Co, PA.
Sylvan worked with Glenn-Gery Brick Co. until 1983 in Watsontown, Northumberland Co, PA. He was a member of Pleasant View Wesleyan Church in Muncy, PA. He served in the military with U.S. Army in WW II. Sylvia Zoe REESE 1 was born on 8 Sep 1942 in Danville, Montour Co, PA. She died on 23 Mar 1996 in Montoursville, Lycoming Co, PA. She was buried in Plot C 87, Muncy Cemetery, Muncy, Lycoming Co, PA.
Sylvia resided in 1991 in Williamsport, Lycoming Co, PA.
Sylvia married John Fioretti ANGELO 1, son of Joseph ANGELO and Louise CARDONE. John was born on 6 Feb 1912 in Staten Island, Richmond Co, NY. He died on 26 Jan 1995 in Montoursville, Lycoming Co, PA. He was buried in Plot C 87, Muncy Cemetery, Muncy, Lycoming Co, PA.
9520 F ii Wilma E REESE. 9521 M iii Ernest W REESE. 4909. Robert Grant LAWTON Sr 1 (Ida Caroline SWEENEY , Sarah Jane BANKES , Caroline BITLER , Mark , John , Johannes ) was born on 4 Oct 1925 in Madison Twp, Columbia Co, PA. He died on 29 Nov 2002 in Montgomery, Lycoming Co, PA.
Red resided in 1930 in White Hall, Anthony Twp, Montour Co, PA. He resided in 1940 in Anthony Twp, Montour Co, PA. He resided in Nov 2002 in 441 Franklin Dr, Montgomery, Lycoming Co, PA. He worked as delivery person with R.W. King in Muncy, PA. He was a member of Maple Hill United Methodist Church. He was a member of Milton Moose Lodge #171 in Milton, PA.
Red married Babe M STAGGERT on 5 Jul 1959. 9522 M i Lester LAWTON. 9523 M ii Robert LAWTON Jr.
9524 M iii Terry KERWELL. 9525 F iv Rebecca LAWTON. 9526 F v Ruth LAWTON. Ruth married Robert YOUNGER "Bob". 9527 F vi Dianna LAWTON. 4913. Charlotte Faye LAWTON (Ida Caroline SWEENEY , Sarah Jane BANKES , Caroline BITLER , Mark , John , Johannes ) was born on 23 Sep 1923 in Madison Twp, Columbia Co, PA. She died in Sep 1983 in Turbotville, Northumberland Co, PA.
Charlotte resided in 1930 in White Hall, Anthony Twp, Montour Co, PA. She resided in 1940 in Anthony Twp, Montour Co, PA. She worked as helper - home in 1940. Charlotte married Leighton Leroy HARTMAN Sr, son of Gideon Bloch HARTMAN and Ida Blanch SMITH. Leighton was born on 4 May 1912 in Turbotville, Northumberland Co, PA. He was baptized on 13 Oct 1912 in Trinity UCC, Turbotville, Northumberland Co, PA. He died in Jun 1970 in Turbotville, Northumberland Co, PA.
Leighton resided in 1920 in Anthony Twp, Montour Co, PA. He was confirmed a member of the Trinity U.C.C. church on 17 Apr 1927 in Turbotville, Northumberland Co, PA. He resided in 1930 in Anthony Twp, Montour Co, PA. 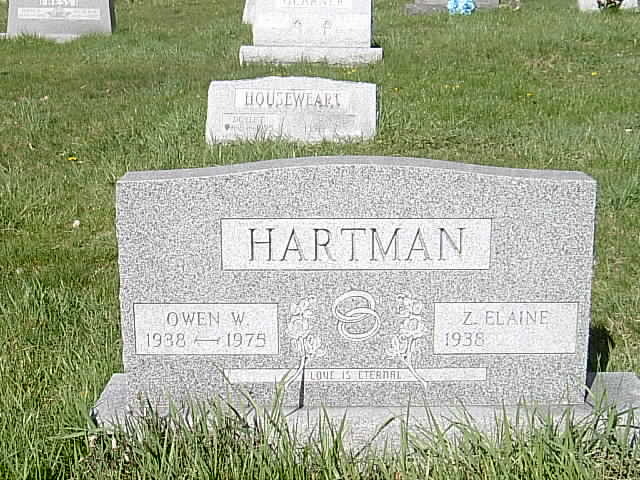 He resided in 1940 in Danville State Hospital, Mahoning Twp, Montour Co, PA.
+ 9528 F i [Female] HARTMAN is printed as #5888. + 9529 F ii [Female] HARTMAN is printed as #5889. 9530 M iii [Male] HARTMAN is printed as #5890. + 9531 F iv [Female] HARTMAN is printed as #5891. + 9532 M v [Male] HARTMAN is printed as #5892. + 9533 F vi Charlotte Jane HARTMAN is printed as #5893. 4916. Harold Sparks ARTER [scrapbook] (Harvey Oscar ARTER , Lovena Dianna BANKES , Caroline BITLER , Mark , John , Johannes ) was born on 29 Aug 1906 in Pike Co, PA. He died in Jul 1979. He was buried in Lords Valley Cemetery, Lords Valley, Pike Co, PA.
Harold resided in 1920 in Hawley, Wayne Co, PA. He resided in 1935 in Lords Valley, Pike Co, PA. He resided in 1940 in 21 Baumo Ct, Livingston, Essex Co, NJ. He worked as machinist - printing press in 1940. Harold married Muriel Ruth [scrapbook] 1, 2. Muriel was born on 17 Aug 1912 in Newark, Essex Co, NJ. 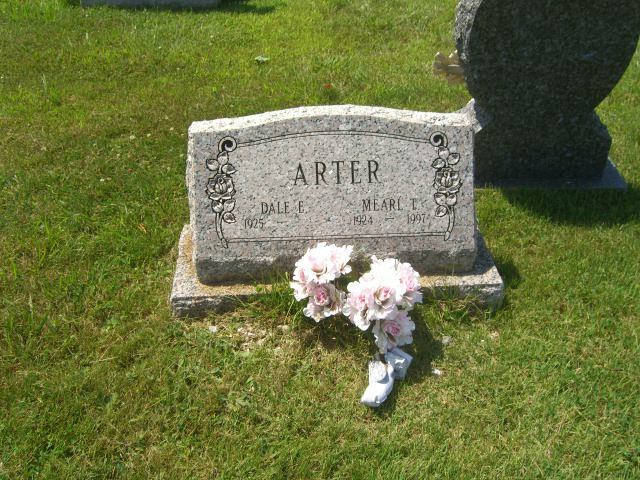 She died on 7 Mar 2005 in Winter Haven, Polk Co, PA. She was buried in Lords Valley Cemetery, Lords Valley, Pike Co, PA.
Muriel resided in 1935 in Lords Valley, Pike Co, PA. She resided in 1940 in 21 Baumo Ct, Livingston, Essex Co, NJ. She was a member of Baptist church in Blooming Grove, Pike Co, PA. She resided in North Fort Myers, FL. She resided in Dec 2003 in Fort Myers, FL. She resided in 2005 in Davenport, Polk Co, FL. The cause of her death was kidney failure. 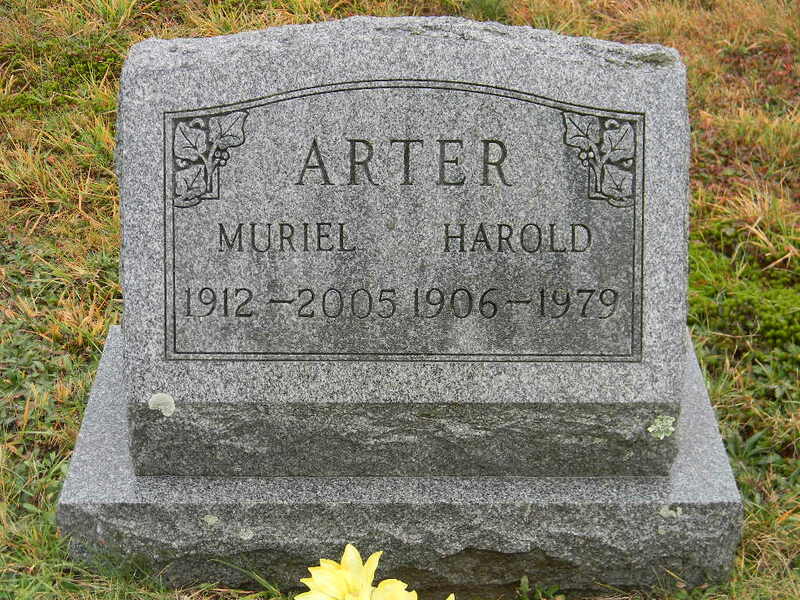 + 9534 M i Harold J ARTER was born on 28 Oct 1934. He died on 5 Dec 2003. Robert H ARTER was born on 8 Feb 1937 in NJ. He died on 11 Sep 1990. He was buried in Lords Valley Cemetery, Lords Valley, Pike Co, PA.
Robert resided in 1940 in 21 Baumo Ct, Livingston, Essex Co, NJ. 4917. Fannie Lovenna ARTER 1 (Howard Franklin ARTER , Lovena Dianna BANKES , Caroline BITLER , Mark , John , Johannes ) was born on 25 Dec 1904. She died in 1991. She was buried in Wesley Chapel Cemetery, Talmar, Columbia Co, PA.
Fannie resided in 1920 in Pine Twp, Columbia Co, PA. She resided in 1930 in State Rt 415, Ross Twp, Luzerne Co, PA. She resided in 1940 in Pine Twp, Columbia Co, PA.
Fannie married Owen Willetts HARTMAN 1 on 5 Jul 1924. Owen was born on 28 Sep 1901. He died on 24 Dec 1979. He was buried in Wesley Chapel Cemetery, Talmar, Columbia Co, PA.
Owen resided in 1930 in State Rt 415, Ross Twp, Luzerne Co, PA. He worked as teamster - lumber job in 1930. He resided in 1940 in Pine Twp, Columbia Co, PA. He worked as farmer - farm in 1940. 9536 F i Vida E HARTMAN. + 9537 F ii Vivian Jean HARTMAN was born on 13 Feb 1927. She died on 4 Aug 2011. + 9538 M iii Howard T HARTMAN Sr.
9539 F iv Beverly J HARTMAN. Owen HARTMAN Jr [scrapbook] was born on 17 Jan 1938 in PA. He died in Nov 1975. 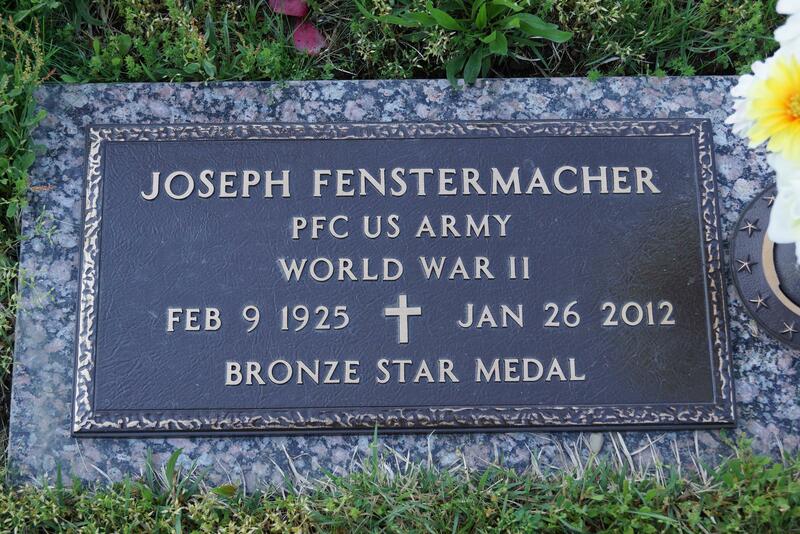 He was buried in Raven Creek Cemetery, Benton Twp, Columbia Co, PA. Skip resided in 1940 in Pine Twp, Columbia Co, PA. He was issued a social security number in 1954/1955 in NJ. Skip married Z Elainer GULLIVER. 4918. Willard Earl ARTER [scrapbook] (Howard Franklin ARTER , Lovena Dianna BANKES , Caroline BITLER , Mark , John , Johannes ) was born on 9 Jan 1908 in Franklin Twp, Lycoming Co, PA. He died in Jan 1982. Willard resided in 1920 in Pine Twp, Columbia Co, PA. He resided in 1930 in 421 Bennett St, Montoursville, Lycoming Co, PA. He worked as laborer - sand plant in 1930. He resided in 1940 in Pine Twp, Columbia Co, PA. He worked as clerk - store in 1940. He worked as farmer - farm in 1940. He resided in 1944 in Benton, Columbia Co, PA. He served in the military with U.S. Navy from 5 Apr 1944 to 17 Oct 1945 in NAS, Norfolk, VA. He was issued a social security number before 1951 in PA. He resided in 6031 Edward Dr, Mechanicsburg, Cumberland Co, PA. He resided in 1982 in Camp Hill, Cumberland Co, PA.
Willard married Elizabeth BLAINE. Elizabeth was born about 1907 in Luzerne Co, PA.
Elizabeth resided in 1930 in 421 Bennett St, Montoursville, Lycoming Co, PA. She resided in 1940 in Pine Twp, Columbia Co, PA.
Dale E ARTER [scrapbook] 1, 2 was born on 30 May 1925 in Forty Fort, Luzerne Co, PA. He died on 17 Nov 2010 in Medicenter, Neptune, Nonmouth Co, NJ. He was buried in Evergreen Cemetery, Farmingdale, Monmouth Co, NJ. Dale resided in 1930 in 421 Bennett St, Montoursville, Lycoming Co, PA. He resided in 1940 in Pine Twp, Columbia Co, PA. He resided in 1959 in Shore Area Of NJ. He worked as druck driver with Huffman-Koos until 1985 in Eatontown, NJ. He worked as driver (part-time) with Brices Auto Supply in Neptune, NJ. He was a member of Teamsters Union Local #177 in Hillside, NJ. Dale married Mearl T [scrapbook]. Mearl was born on 9 Sep 1924. She died on 21 Jul 1997 in NJ. She was buried in Evergreen Cemetery, Farmingdale, Monmouth Co, NJ. 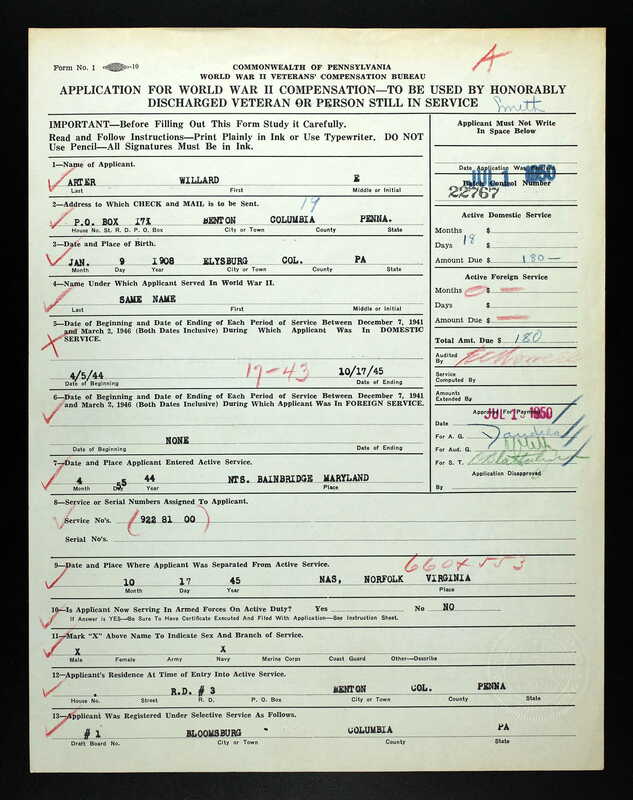 Mearl was issued a social security number before 1951 in NJ. She resided in 1997 in Belmar, Monmouth Co, NJ. 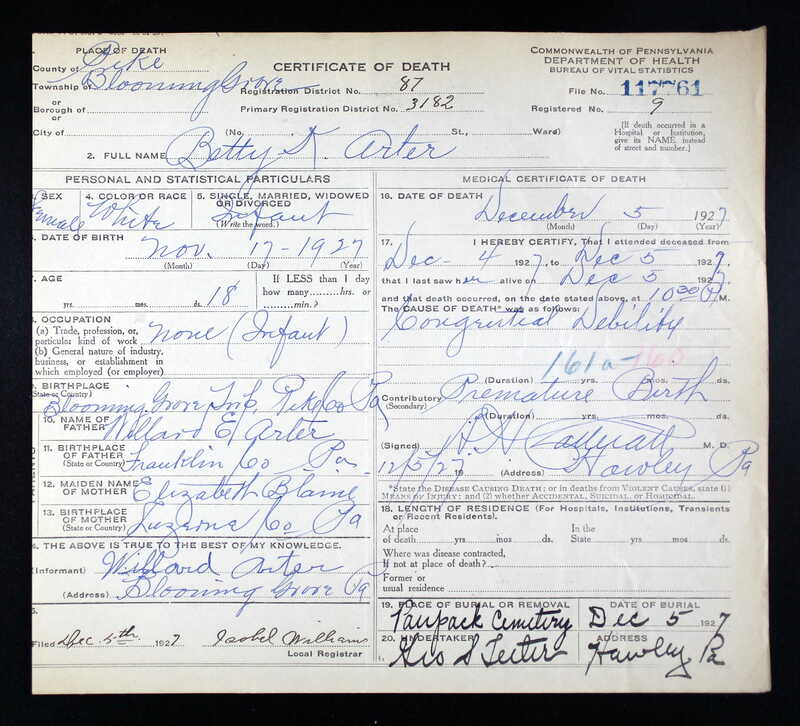 Betty K ARTER [scrapbook] was born on 17 Nov 1927 in Blooming Grove, Pike Co, PA. She died on 5 Dec 1927 in Blooming Grove, Pike Co, PA. She was buried on 5 Dec 1927 in Paupack Cemetery, Paupack, Pike Co, PA. The cause of her death was premature birth. George ARTER [scrapbook] was born on 28 Oct 1929 in Montoursville, Lycoming Co, PA. He died on 26 Mar 1931 in Montoursville, Lycoming Co, PA. 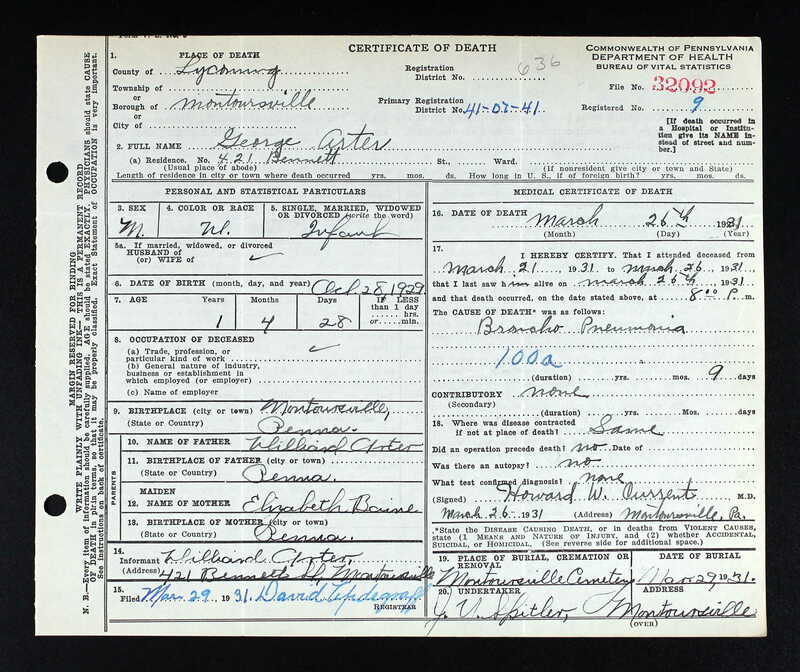 He was buried on 29 Mar 1931 in Montoursville Cemetery, Montoursville, Lycoming Co, PA.
George resided in 1930 in 421 Bennett St, Montoursville, Lycoming Co, PA. The cause of his death was pneumonia. 9544 F iv Reta ARTER. + 9545 M v Gale H ARTER was born on 25 May 1934. He died on 5 May 2005. + 9546 M vi Willard Earl ARTER Jr.
4919. Harry Owen ARTER (Howard Franklin ARTER , Lovena Dianna BANKES , Caroline BITLER , Mark , John , Johannes ) was born on 12 Mar 1922 in PA. He died on 18 Feb 1998 in Unityville, Lycoming Co, PA.
Harry resided in 1930 in Bunker Hill Settlement, Greenwood Twp, Columbia Co, PA. He resided in 1940 in Pine Twp, Columbia Co, PA. He worked as farmer - farm in 1940. He was issued a social security number before 1951 in PA.
9547 F i [Female] ARTER. 4920. Edith S EVANS [scrapbook] (Harvey Franklin EVANS , Ida Evans BANKES , Caroline BITLER , Mark , John , Johannes ) was born on 14 Apr 1919 in Montgomery, Lycoming Co, PA. She died on 23 Mar 2012 in Danville, Montour Co, PA. She was buried in Elan Memorial Park, Lime Ridge, Columbia Co, PA.
Edith resided in 1920 in Penn St, Montgomery, Lycoming Co, PA. She resided in 1930 in Locust St, Bloomsburg, COlumbia Co, PA. She resided in 1940 in Bloomsburg Hospital, Bloomsburg, Columbia Co, PA. She worked as student - nurse in 1940. Edith married Joseph S FENSTERMACHER [scrapbook] in Jul 1957. Joseph was born on 9 Feb 1925 in Columbia Co, PA. He died on 26 Jan 2012 in Danville, Montour Co, PA. 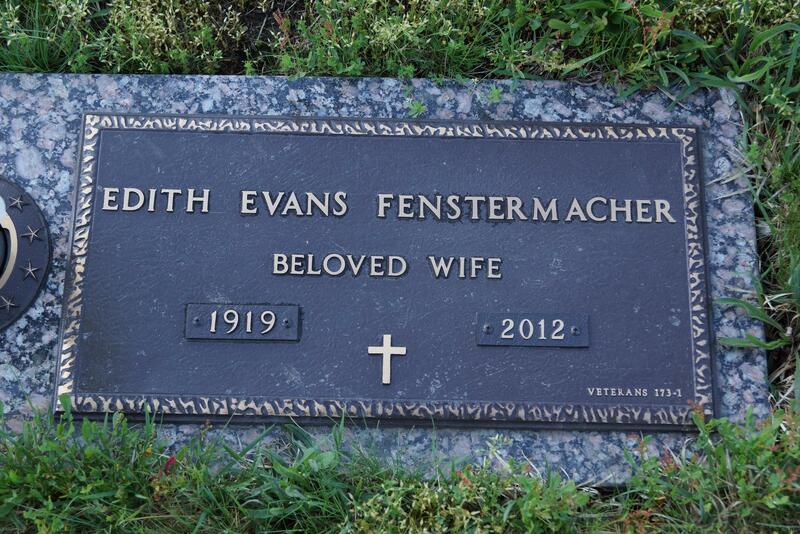 He was buried in Elan Memorial Park, Lime Ridge, Columbia Co, PA.
Edith also married [Male] REMALY. 9548 M i Frank REMALY. 9549 F ii Joyce A REMALY.